February 15th the Parliament of Iceland passed a bill to extend the fishing limits to 50 miles. August 17th The International Tribunal in The Hague pronounced that the Icelanders did not have sovereignty over the areas between 12 and 50 miles. The Icelandic government protested and decided to take no notice of this decree. September 1st the regulation on the extension of the fishing limit took effect. British ship owners asked in vain for battleship protection. 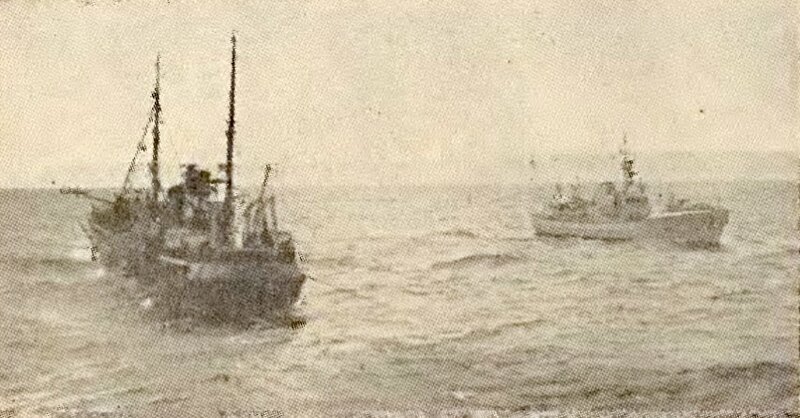 Three West German tow vessels were sent to Iceland to prevent the apprehension of German trawlers within the limit. September 5th the secret weapon of the coast guard, the trawl clippers, created havoc, when the trawler “Peter Scott” was relieved of its fishing gear. The crew threw coal, iron bolts and a fire axe at the coast guard vessel “Aegir”. Altogether 82 trawls were cut during the dispute. May 18th the trawler captains had their fill and refused to continue fishing within the 5 miles limit without the protection of battleships. The British government decided to send frigates to Iceland. This decision was rather unexpected, as a dialogue between the nations on the matter was in progress. Subsequently the Icelandic government refused to continue and banned all British military aircraft from landing in Iceland. May 23rd three British frigates entered Icelandic territorial waters, “Lincoln”, “Plymouth”, and “Cleopatra”. June 20th the tow vessel “Lloydsman” attempted ramming the coast guard vessel “Odinn” north of the Westfiords. July 27th discussions concerning fishing and fishing limits in Geneva showed an increasing support for a 200 miles economic zone. August 29th. The clashes got more serious. A fatal accident occurred, when “Aegir’s” mechanic received an electrical shock. September 11th the government of Iceland declared the discontinuance of diplomatic relations between the two countries, if the battleships and towboats continued their activities within the Icelandic sovereign waters. The NATO Directorate mediated and abetted a reasonable solution. The British Prime Minister pronounced the will of the British people to solve the dispute. September 22nd the Icelanders got the upper hand in the propaganda war with the British after a flight with television camera crews with the coast guard aircraft “Syr” over the battlefield. The same day the British frigate “Lincoln” rammed the coast guard vessel “Aegir” of the east coast and the film material of the television crews showed the unmistakeable breach of the law of the oceans. November 13th the two nations agreed on an armistice, and the Icelandic Parliament passed a bill on a provisional agreement for two years with the British government. Britain’s largest trawlers were exempted from the Icelandic territorial waters and limited fishing quotas were issued for the smaller vessels. This was the end of this stage of the battle.